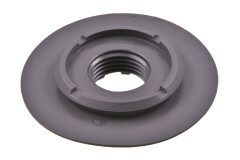 To supplement Carmo popular weldable flange with G 3/4″ thread (03-601), Carmo introduces a new weldable flange (03-606) with G 1/2″ thread. Used extensively in inflatable and maritime structures like rafts, boats, buoys, booms, water bags, water tanks, ballast bags etc. Small protrusions on the underside of the flange ensure that it does not stick to the material, shutting off airflow, in vacuum applications.